0.33 CT.TW. DIAMOND MENS FASHION BAND-Declare your love for the one man you fell head over heels for with this romantic 10 karat white gold diamond ring. 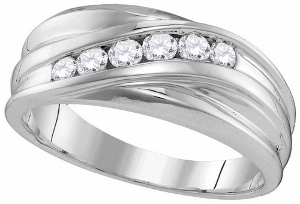 A keepsake honoring your matrimonial unity, rows of round diamonds in a white gold band.